I had a nice visit with knitters working on the Masters Program at Stitches Midwest back in early August. It was a longer drive than I thought, particularly since I only went up for one night. I broke up the drive on the way there and back with a stop at the Albanese Candy Outlet in Indiana. I have a weakness for Gummi Bears. I have a few left from the 5 lb (!) bag I bought. The official start of fall for me is when I start getting more lessons to review and new students signing up for courses. Things have definitely picked up since the first of September. The tip this week is prompted by what I have seen in several lessons. Lesson 2 of the Basics class discusses decreases. Several students have had difficulty spotting the differences between left and right slanting decreases. I've discussed this quite a bit in the past. Here is a link to an earlier entry: Left and Right Slanting Decreases. Another thing covered in the lesson is how to make left and right slanting decreases "match". This is a problem for many knitters. K2tog produces a small, neat decrease that slants towards the right. The problem is with left slanting decreases. They will NEVER EVER truly match a k2tog but you can work to make them as small and unobtrusive as possible. To make this decrease you have to reorient the stitches to be decreased on the needle so that the decrease will not be twisted. This is done by slipping them back to the needle which stretches them out. An SKP decrease requires slipping one stitch and an SSK requires slipping two. If you use just your needle tips you can minimize how much the stitch is stretched out. In the photograph below, I have done that to make the decreases. Notice that the SKP is larger than the SSK. 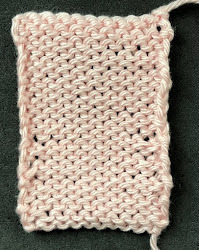 By the way, if you are doing the Masters Program, do not use the method where only the first stitch is slipped. The stitch underneath is twisted and yes, this is visible. I won't be having salon this weekend. Stay tuned. I've been working on a poncho for the Winter Cast On. At TNNA this summer, they were showing a lot of cabled sweaters and ponchos/ruanas. I decided to do a cabled poncho. What was I thinking? It is a lot of knitting. I am almost finished with the first piece. I'm using Kelbourne Fibers Arranmore Light which is wonderful to work with. Here is a partial view. The cables are meant to look like snakes. They are random and asymmetrical.